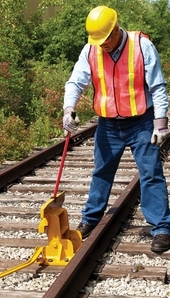 Derail lifting lever for hinged derails. 24" long handle. Handle effort 20 lbs. to flip the derail. For 1" or 3/4" thick derail blocks. • Please check block thickness before ordering lever. Product Reviews for Aldon 4014-28 Derail Lifting Lever-3/4"